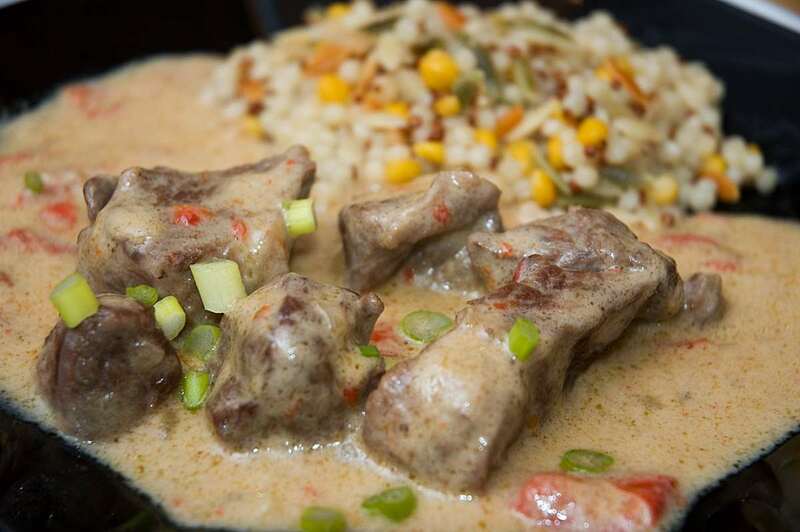 Lamb meat in coconut milk sauce with ginger, garlic, red bell peppers, chillies and lime. This recipe is the result of a little experiment that turned out very, very well. Cooked in the pressure cooker for less than 30 minutes, the result is tender lamb in a flavorful sauce. Set 5qt / 5l pressure cooker over high heat. Add vegetable oil and lamb meat cubes. Brown lamb well from all sides (ca. 5 minutes), then remove from pot and set aside. Reduce heat. Add onions, cook until soft and translucent but do not brown. Add ginger, garlic, bell peppers, lime zest and chillies. Cook until vegetables start to soften. Add salt. Add coconut milk and lime juice and bring to a simmer. Return meat to pressure cooker, put on lid. Cook on high pressure for ca. 25 minutes. Release pressure. Mix cornstarch with a few tbsp of water. Stir in, cook on low heat until the sauce thickens. Adjust seasoning with salt. Serve. Garnish with chopped scallions. In the photo, the lamb is served with mixed grains, but the dish would also go well with rice or pasta. My husband cooked this for me tonight- it was very delicious - lamb very succulent and all prepared very quickly in the pressure cooker. Had it with noodles which complemented the sauce perfectly. I made this last night and it came out great, though I added a tiny bit of sweetener to round it out (I used one packet of Splenda, it did the trick. A small amount of honey would also work.) It was my first time using my new 5 qt. Kuhn Rikon pressure cooker and it worked like a champ. I served this along with some red quinoa made with chicken broth, and added toasted pumpkin seeds, almonds, and raisins. It was delicious with the lamb coconut gravy. Steffen, I just found your site and your recipes look fabulous. I can see myself making a lot of them in the weeks to come.